Shredmeister Chris Impellitteri brings us a new disc of his guitar expertise with 'Wicked Maiden.' Impellitteri has always insisted, at least of late, that his projects have always been band based, and just named after him like Van Halen. In this sense, Chris is the guitar player and the brand. Therefore, when creating the next 'Impellitteri' work we should expect him to surround himself with a select band and then compose full song arrangements, not just canvases for his guitar solos. On 'Wicked Maiden,' that is pretty much what you get. Unfortunately, except for a few songs, most of the compositions are average. Conversely, the song composition is often dull and repetitive wavering equally between melodic heavy metal and melodic power metal. Of these, I found 'Weapons Of Mass Distortion' and 'The Vision' to be more provocative and entertaining. Yet, the real surprises are when Impellitteri and company venture beyond the usual. First, 'Garden Of Eden' has melodic metal overtones, yet also has the strength and hooks of melodic hard rock. Second, 'Hi-Scool Revolution' surprises as it sound more like boogie rock with a classic rock guitar solo. 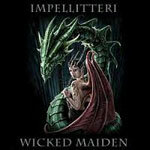 Impellitteri's 'Wicked Maiden' is a better than average piece of guitar driven melodic heavy metal; I'm sure his fans will be pleased. However, despite his and Rob Rock's contribution to lyrics and song composition, much of this album falls flat due to the repetitive melodic and power metal arrangements.